Birthdays can be a nightmare. The incessant WhatsApps, emails and calls asking what you want for your big day? What on earth do you ask for when you've everything you could possibly need? Our newest volunteer, Ntate Thabo, has come up with an incredibly awesome, generous and selfless answer! 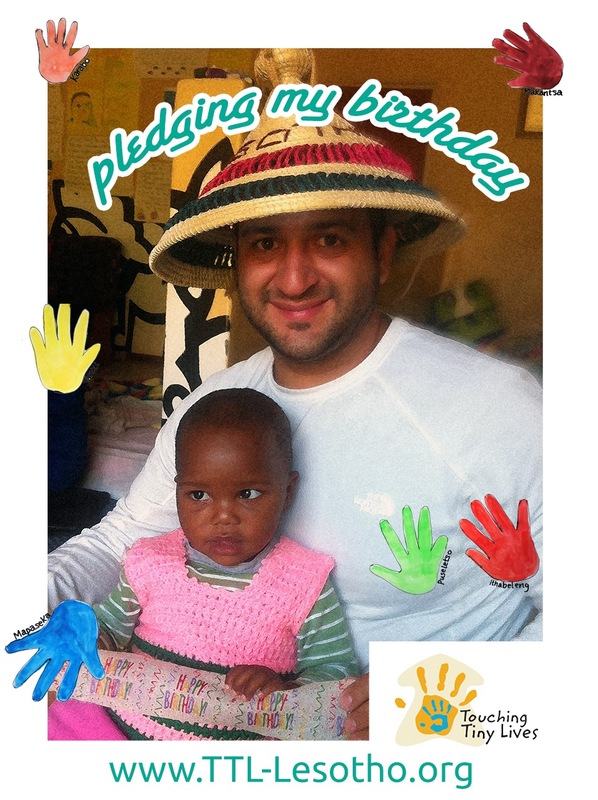 He's decided to pledge his birthday to Touching Tiny Lives! Instead of asking for gifts from his family and friends, he has asked that they donate the money directly to TTL! It got us thinking, 'What if other people could do the same?' If you have a birthday coming up, and can't think of anything you want, could YOU help us to mitigate the effects of HIV/AIDS in children under the age of 5 in rural Lesotho? What does it mean to pledge your birthday? Ask all your family and friends to donate the money they would have spent on a gift/ birthday drinks to us via this link. You can either choose to set up your own fundraising account, specifically for this campaign, OR you can ask them to simply DONATE and select the Pledge Your Birthday project. Why us? Why Touching Tiny Lives? Let me explain our story and why we desperately need your help. We work in the Mountain Kingdom of Lesotho, the land where 1/4 of the population are without work and a further 1/4 of the population have HIV or AIDS. Children are born facing life-threatening challenges from day 1. TTL started ten years ago in response to the crisis of children dying of malnutrition before their first birthday. We work within our limits to rescue one child at a time from the clutch of malnutrition and to face a brighter future. We are the only organisation serving a population of 230,000 people to mitigate the effects of HIV/AIDS in children under the age of 5. Mothers, Grandmas and Fathers walk and ride their horses for miles to reach out to us. There are few paved roads and so they are travelling across very mountainous and tough terrain. If their child is critically malnourished, we take them into the Safe Home and care for them until they are well enough to return home. We then continue our support through the Outreach team. These guys are my heroes. They drive for hours and hours every day up mountains and over ridges to deliver food packages and provide medical, nutritional & development support to families who struggle to put food on the table. Without TTL, there would be no focused help. Without TTL, these children would have no future. Watch the video below or click here to read their stories and decide whether you can donate your gift this one year and help us continue to support children of their community,one child at a time. How does it work? Ask people to send what they would normally spend on a gift to TTL using GivenGain! It’s best to start fundraising a few months prior to your birthday to get the ball rolling. First and foremost, give your TTL fundraising page a catchy title, for example ” £8 for my 8th Birthday!” Include your reason for pledging your birthday and maybe even a photo. Once your page is up and running, email a link to your friends and family, inviting them to donate to your page. Don’t forget to reach out to your social media network as well. Keep your donors updated about your fundraising total up until the big day and then do one last push. People will give whatever they can give and 100% of it will go directly to helping us to support more children, one child at a time. So, if you can, please do this to help us to continue making a difference in one of the poorest regions in the world. Thank you from the bottom of our hearts and good luck with your fundraising!